The Corbett National Park is regarded as the heaven for Tigers as well as its prey including varieties of Deers, wild boars and other lesser known animals. If you want to track leopards then you can locate them in the hilly part of the Park. 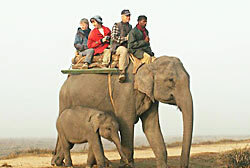 Elephants are one of the main attractions of the Corbett Park. In the southern part of the Park you can spot the Dole or Wild Dogs and Jackals. The Langurs can be spotted all over the Park.The best way to explore the Corbett National Park is by hiring a safari with the sunrise and sunset being the best time to watch the wildlife that moves. Bijrani: The area in and around Bijrani once formed part of a shooting block. During the British period, it was much famed for the quality of game hunting that it offered to shikaris. In comparison to Dhikala, the terrain at Bijrani is drier and also has more diverse vegetation. Jhirna: Jhirna was a farming village until 1994 when it was successfully relocated under Project Tiger. The abandoned farmland is gradually reverting to a wild state and is being managed to develop grassland habitat. The nearby terrain consists of numerous sots and narrow gorges running typically through the Shiwalik landscape. The hills to the north of Jhirna are covered with dense patches of bamboo. Apart from being a good habitat for tiger, leopard and deer, the place hosts other interesting mammals like sloth bear and wild boar. 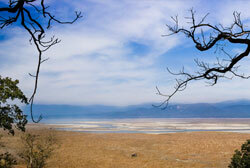 The place is also ideal to enjoy a panoramic sight of some interesting birds. Durga Devi: Durga Devi is a tourism zone within the Corbett National Park. It is a virgin area used only for long elephant safaris and has access to the Ramganga River for the purpose of fishing. Leisure Hotels has got the opportunity to have the first private lodge in the area, accessible through the Durga Devi gate of the park and will be providing angling facilities at the Jamun camp in the private untouched pool in the Ramganga River. 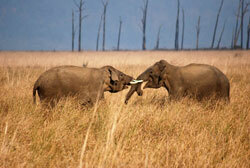 Dhikala: Dhikala is the most well known tourist destinations in Corbett. It is located at the edge of the broad Patli Dun valley through which the Ramganga flows in numerous channels. Dhikala offers an awesome unhindered view of the valley, with the Kanda ridge in the backdrop. Sitavani: Sitavani is located about 35 km. from The Corbett Hideaway & The River View Retreat and within the reserve forest area of Ramnagar Forest Division. It boasts of beautiful dense forests of sal and mixed vegetation with open grasslands and riverbeds. The safari takes one to the ancient temple of Goddess Sita. According to a legend, this is the place where Goddess Sita disappeared into the earth. The forest offers ample birding opportunities in the surrounding thick sal and mixed forest. Preferably early morning drive is the best to view wildlife like tiger, sambar, barking deer, porcupine, King cobra and lots more. Sitavani is well known for the wild elephants and tiger all round the year as both the animals frequently visit the river Kosi for water and get across to raid the crops and lift the domestic animals that stray away from the village. Garjia Temple: 14 kms from Ramnagar, on the way to Ranikhet, is a huge rock in the midst of river Kosi. This place has been named Garjia Devi after the deity. The temple is visited by thousands of devotees from different parts of the state. A large fair is held here on Kartik Poornima. Corbett Wildlife Museum: The Corbett Museum at Dhangarhi houses the belongings of Mr. Jim Corbett, with some of the animals at Corbett National Park.